With this delightful kit, you can make fun challenges to measure your pets’ physical and mental skills. You’ll have a lot of fun, and so will your pets! Be amazed as you and your pet explore the Alligator Road Challenge, the Marble Race, the Flip Jar Tower Maze, the Spring Surprise, and the Triple Brain Buster! Make your own custom toy mouse! Bake some homemade kitty cookies with the included kitty cookie cutters! 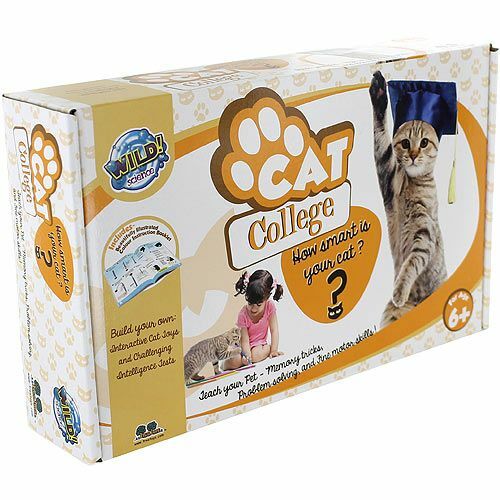 Even design your own amazing tricks using the prestigious and (feline)world-renowned Cat College Activity Centre. The full color instructions even include recipes for delicious training treats like Mouse-Free Mouseburgers and much much more. Spend some quality time bonding and playing with your pet as both of you learn important scientific concepts and skills!